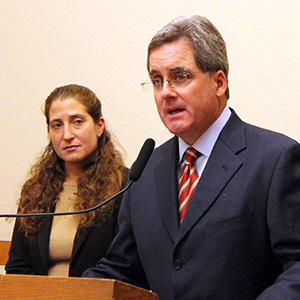 Deputy City Attorney Sara Eisenberg and City Attorney Dennis Herrera, at a Jan. 2, 2014 news conference on the ACCJC case. SAN FRANCISCO (Aug. 28, 2015)—City Attorney Dennis Herrera today praised a state Task Force on Accreditation for a report that blames the Accrediting Commission for Community and Junior Colleges, or ACCJC, for a pattern of failures and broken promises, and for fostering a difficult climate within California’s Community College system that ultimately cost it the confidence of its 113 member institutions. The Task Force appointed by California Community College Chancellor Brice W. Harris issued the comprehensive 274-page study, which recommended replacing the ACCJC with “a new model for accreditation” that could include a combined regional system to evaluate community colleges along with four-year colleges and universities. Herrera sued the ACCJC in San Francisco Superior Court on Aug. 22, 2013, alleging unfair and unlawful practices in the accrediting agency’s evaluation of City College of San Francisco. Months later, blaming ACCJC for delays aimed at “running out the clock,” Herrera filed a high-stakes motion for preliminary injunction to block the ACCJC from moving forward with its plans to terminate the college’s accreditation. San Francisco Superior Court Judge Curtis E.A. Karnow granted the major portion of Herrera’s motion on Jan. 2, 2014, preliminarily enjoining the commission from finalizing its planned termination of City College’s accreditation during the course of the litigation. On Jan. 16, 2015, Judge Karnow vindicated Herrera’s civil suit with a 72-page ruling that found ACCJC had engaged in “significant unlawful practices” in reaching its controversial 2013 decision to terminate City College of San Francisco’s accreditation. The outcome offered City College a new option to pursue to secure its accreditation, and included injunctive provisions to assure the college of a fairer, more transparent process moving forward. The ACCJC took its first public step to terminate City College’s accreditation in June 2012, when the private commission unexpectedly issued the harshest sanction an accreditation process can produce: a “show cause” letter, placing the burden on the college to prove why its accreditation should not be terminated. A year later, in June 2013, despite significant progress to address the deficiencies identified by accreditors, the commission announced its intention to terminate City College’s accreditation effective July 31, 2014. Such a termination would have made City College’s closure a virtual certainty.